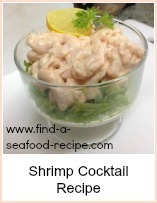 This shrimp cocktail sauce is so easy to make. 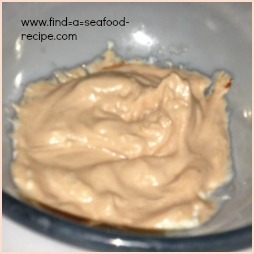 You only need 2 basic ingredients and you will be able to use this seafood sauce on your shrimp cocktail or as a dip. 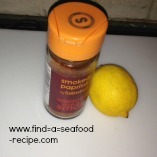 You can season it after you taste - a squeeze of lemon, some black pepper - don't use salt until you serve the finished dish. 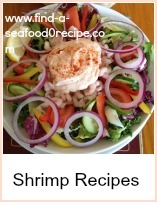 It's so useful - dollop it onto avocado, salads or use it as a dip with crackers, crudités or potato chips. 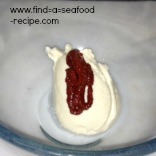 If you want to make your own mayonnaise, there is a short video at the bottom of the page - or you can click here to get the recipe to make mayonnaise yourself either the 'old fashioned' way by hand or the quick blender method. So here's the 2 basic sauce ingredients. You can of course make your own mayonnaise if you prefer. For enough sauce for 4 people put 4 tablespoons of mayo and about 1 of puree into a mixing bowl. 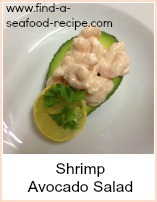 You can always add a little more if you need to as this shrimp sauce is so quick to make. Mix the two together - you can tell when it's done as the sauce goes a pretty pink colour. The photo here on the right shows you what it should look like. After you you've tasted it, you might want to squeeze a few drops of lemon juice. What I normally do is cut a lemon up so people can add it to their own shrimp cocktail. I also put a sprinkling of paprika on the top of the sauce to give a bit of color and flavour. 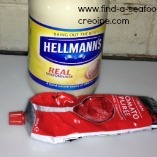 If you want to make your own mayonnaise, here's a very short video showing you how easy it is. 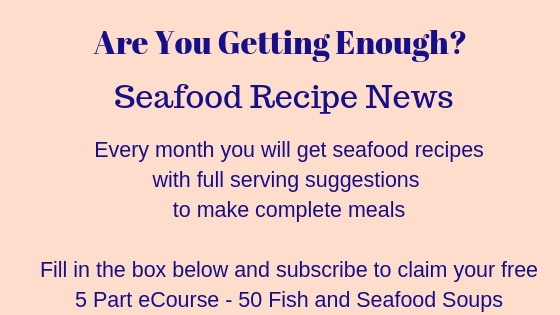 You will need three egg yolks to 300ml (1 1/4 cup) groundnut oil - you can use other oils, but they will add their own flavour to the mayonnaise, which you may not want. Personally, I use olive oil as I don't want to have lots of different bottles open in my cupboard. Also, I use two whole eggs rather than three egg yolks. Two ingredients plus seasoning makes the easiest but tastiest shrimp cocktail sauce.